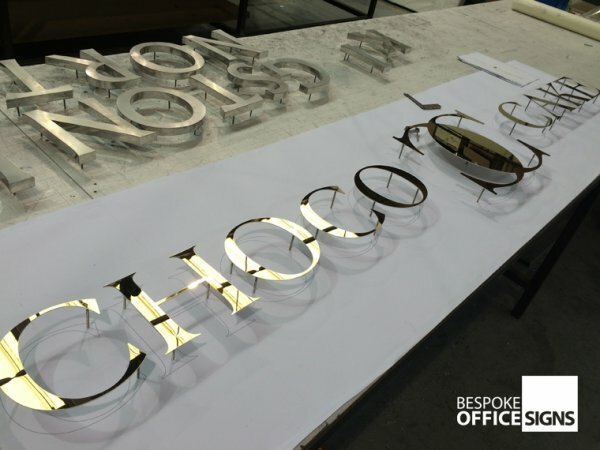 A huge range of font typefaces or logos can be produced in metal and we can advise you on which metal would work best for your sign. 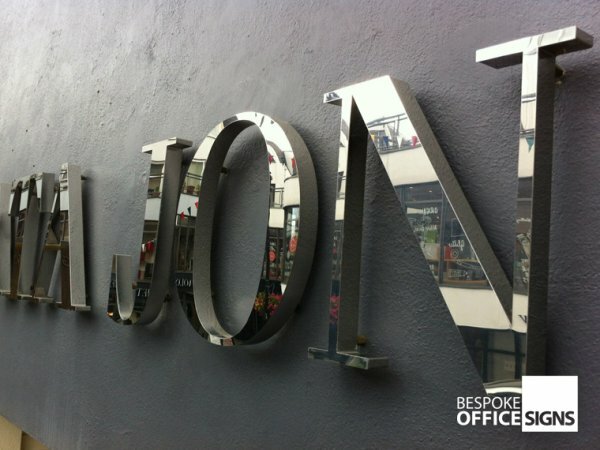 Alternatively, if you already have a font or exact requirements then we’re just as happy to work to them. 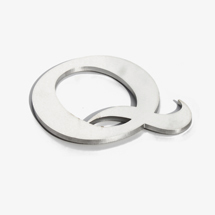 When selecting a metal, it’s important to go for a quality material that is guaranteed free from defects and that is designed to deliver the right results. 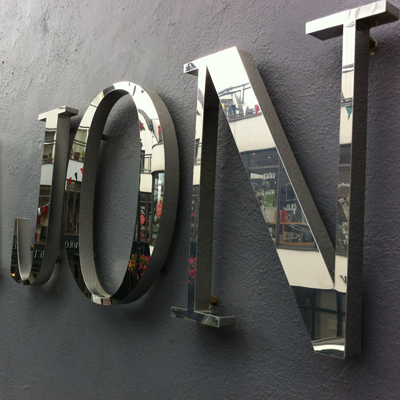 We source our metal from leading suppliers when manufacturing Reception Signs South Africa. 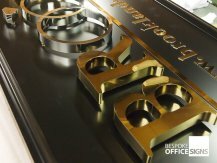 This gives you the best material at a great price. 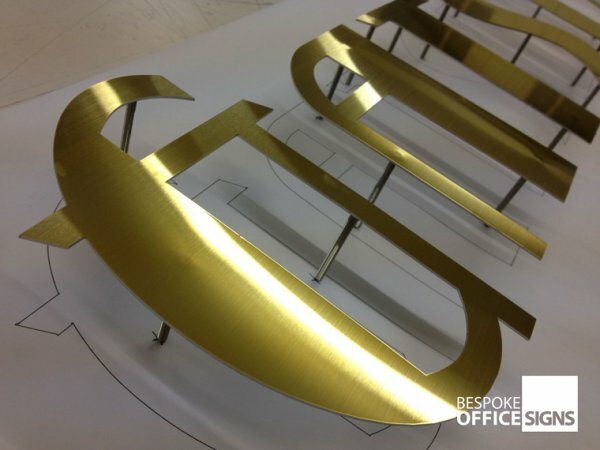 The materials are then cut into letter shapes or company logos to match your individual design requirements. 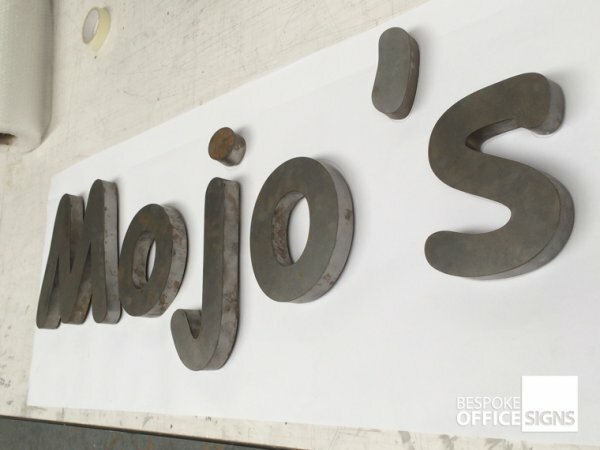 Made typically from a mild steel, our rusted flat letters are bespoke and made-to-order in a range of sizes, fonts, and thicknesses. 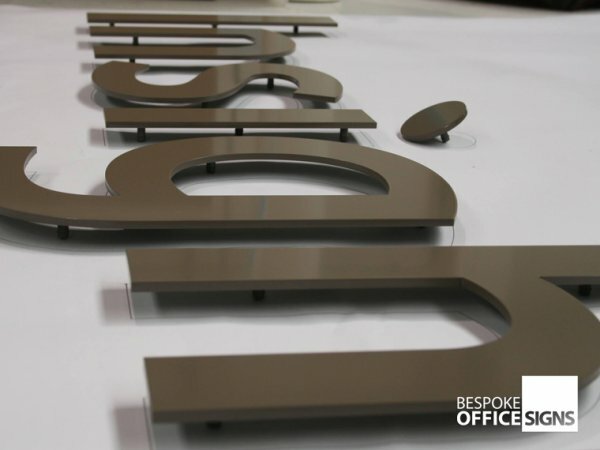 Our rusty steel letters are available in a number of thicknesses such as 2mm and 3mm, however, if you require an alternative size then please speak to a member of our sales team. 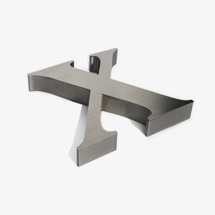 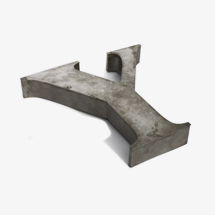 Made typically from mild steel, our rusty 3D logos are bespoke and made-to-order in a range of sizes, fonts, and thicknesses. Our rusty letters are available in a number of thicknesses such as 20mm, 30mm, 40mm, 50mm and even 100mm, however, if you require an alternative size then please speak to a member of our sales team. 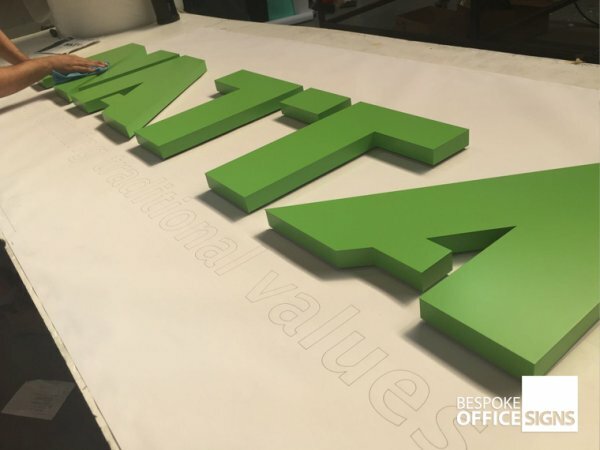 Made from pre-colored aluminum composite also known as dibond, our flat cut aluminum composite letters are bespoke and made-to-order in a range of sizes, colors, and fonts. 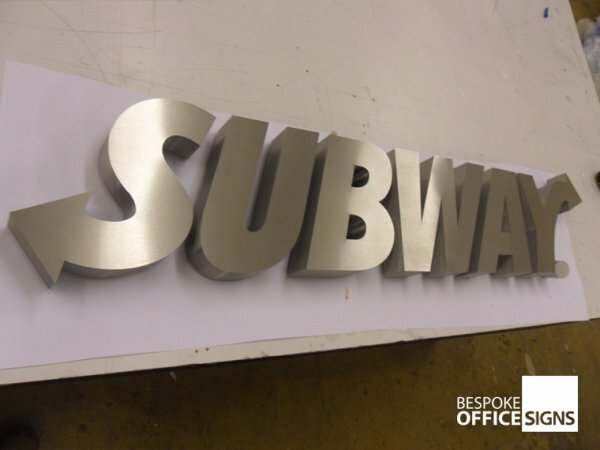 A sheet of aluminum composite is CNC-cut to the font and size required for being hand finished and polished. 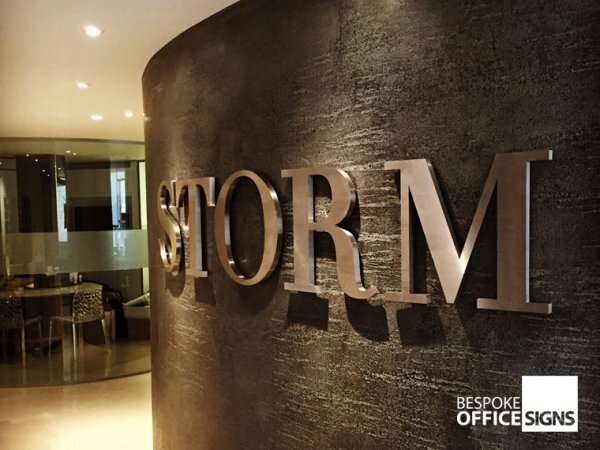 The logo can then be fitted with an internal wall or external wall using either raised fixings or flush to the wall fixings. 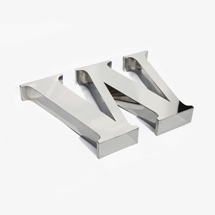 Made typically from commercial quality 304-grade steel, the 3D logos are bespoke and made to order to whichever font or size you need. 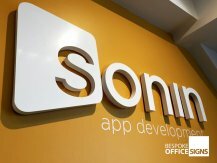 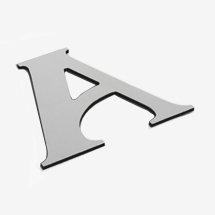 A flat sheet of steel is laser-cut to the shape and size of the logo or font. 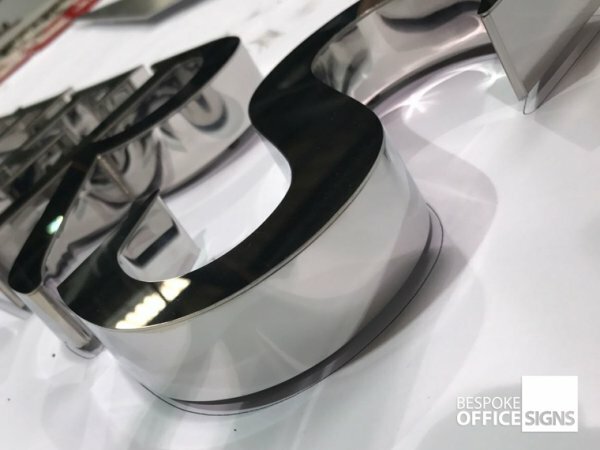 In order to create the depth of the letter, a return strip of steel is welded onto the side of the letter which makes it look solid and three-dimensional. 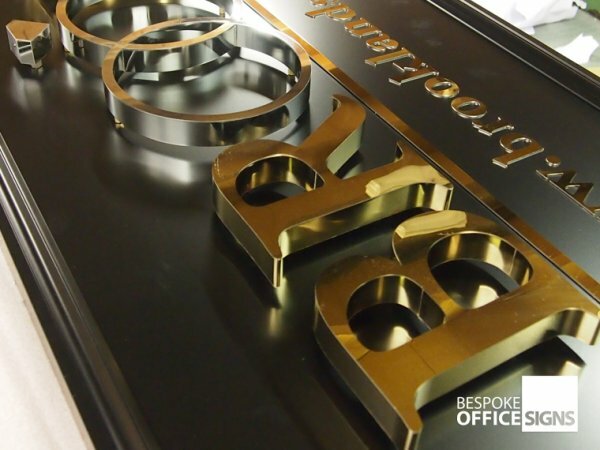 The letters can be painted and fitted with a range of coloured acrylic faces. 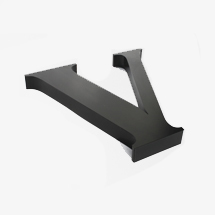 Made typically of commercial quality 304-grade steel, the 3D logos are bespoke and made to order to whichever font or size you need. 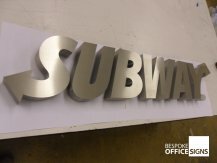 There are many ways of fixing the metal lettering in place. One of the most effective is nut and bolt fixings, these can be used on metal letters up to a height of around 60cm. Any bigger than this then your metal sign will be too heavy for these fixings. The option for larger metal letters and signs is to use a threaded rod which is fixed to the rear of the letters – these are then pushed into your fixing holes and held secure with either resin or silicone. 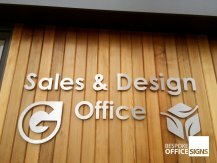 Built up letters give you a three-dimensional feel to your sign which makes them stand out from the flat cut lettering. 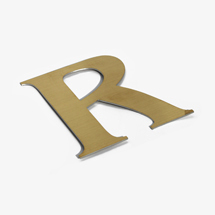 This type of metal lettering is manufactured from a flat metal sheet and fabricated to produce each unique letter. 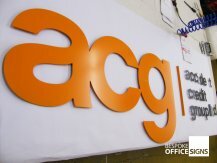 The built-up letters consist of a “letter face” which is displayed on the front of the sign and a “return side” which is also visible when fixed to the wall. 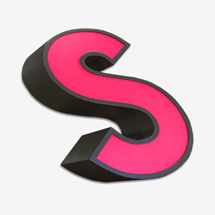 This method gives the illusion that the letters are solid when in actual fact they’re hollow. 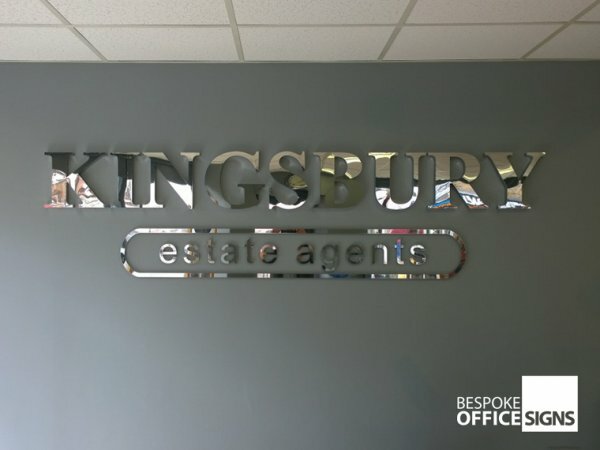 The advantages of using this method are it reduces the cost as well as the weight of the shop sign so they can be displayed and fixed to virtually any wall or front of the shop. These type of letters are made to order in a range of fonts, sizes, and styles. 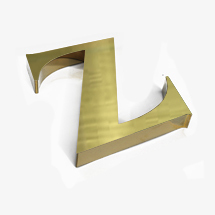 The shape of the letter is laser cut from a flat sheet of metal. 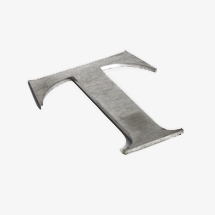 A strip of metal is folded around the side of the letter to create the return side and depth of the letters. 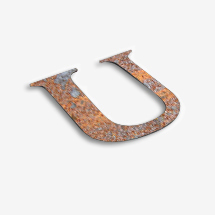 This is usually soldered to the side of the letter and a range of return sizes are used depending on how thick or chunky you’d like the letters to look. The letters are then fitted to the wall with a two-part nut and bolt fixing. The male-part of the fixing is welded onto the back of the letter. The female part of the fixing is fitted onto the wall. The two parts of the fixing then slot together and are tightened up securely with a spanner to ensure they’re securely into position. 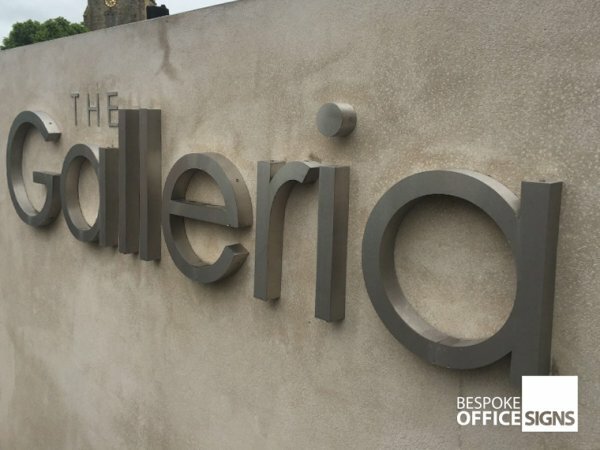 Flat cut letters are also designed to give you a three-dimensional feel to your sign – they’re just not as chunky as the Built Up 3D Metal Letters. 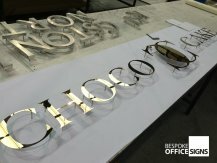 This type of metal lettering is manufactured from a flat metal sheet and fabricated to produce each unique letter. 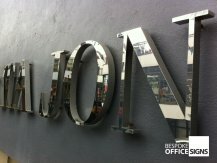 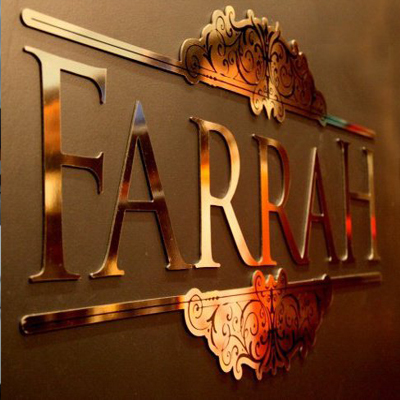 The flat-cut letters consist of a “letter face” which is displayed on the front of the sign and not a “return side”. 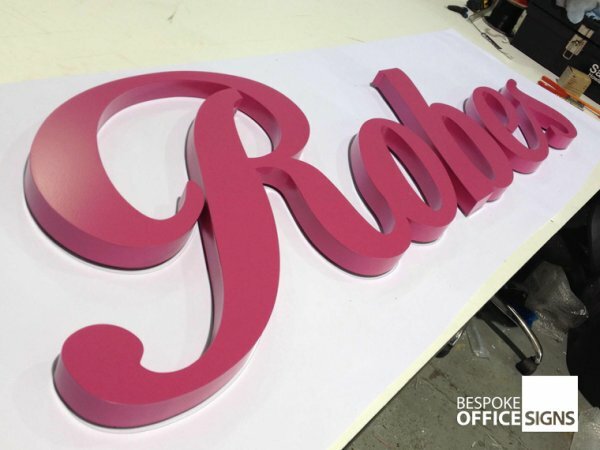 The advantages in using this method are it reduces the cost compared to the built-up letters as well as the weight of the shop sign so they can be displayed and fixed to virtually any wall or front of the shop. 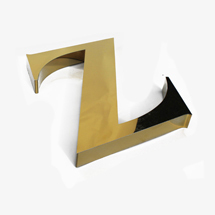 These type of letters are made to order in a range of fonts, sizes, and styles. 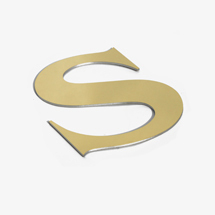 The shape of the letter is laser cut from a flat sheet of metal. The letters are then fitted to the wall with a two-part nut and bolt fixing. 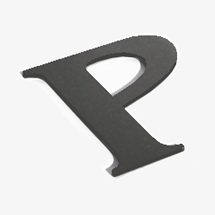 The male-part of the fixing is welded onto the back of the letter. 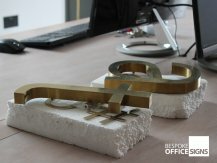 The female part of the fixing is fitted onto the wall. 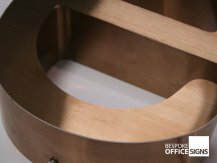 The two parts of the fixing then slot together and are tightened up securely with a spanner to ensure they’re securely into position. 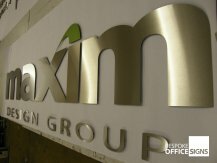 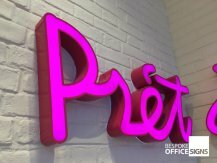 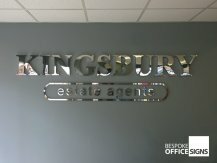 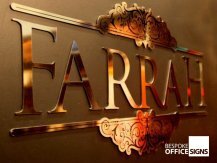 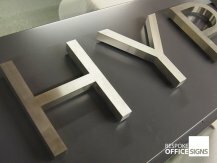 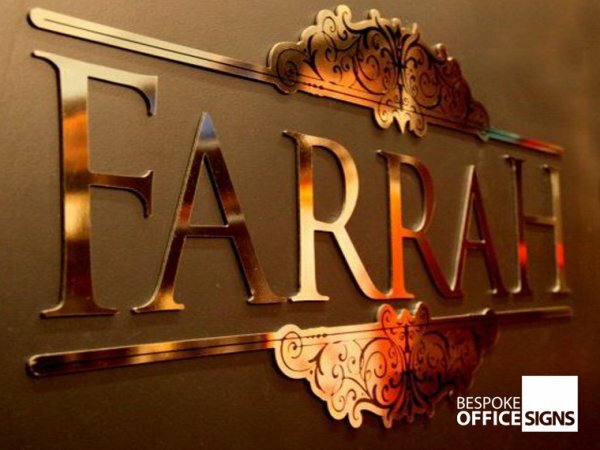 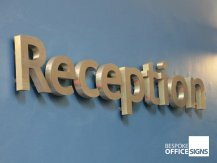 3d Metal Logos Manufacturers often use the above fixings for Custom Metal Logo Signage, Reception Signs South Africa and Raised Metal Office Signs.